Today, we take a short drive out of town to our start point on the north end of Osoyoos Lake, then we climb on the bikes and head north where we'll connect with the International Hike/Bike trail along the Okanagan River Channel. The first half is a relaxing ride that won't unduly tax your legs. We ride through Oliver and make our first stop at Medici's Gelateria, around then connect with Tuc-el-Nuit drive at the head of the trail. We then start heading south back to Oliver on the east side of Tuc-el-Nuit lake. We'll be met by our support truck near Oliver and load the bikes up for a short but steep uphill drive to our lunch destination, the Miradoro Bistro at Tinhorn Creek Winery. After lunch we ride back to Black Sage Road, stop for a wine tasting at Silver Sage Winery and then ride the rolling country side of Okanagan Wine Country back to Osoyoos. 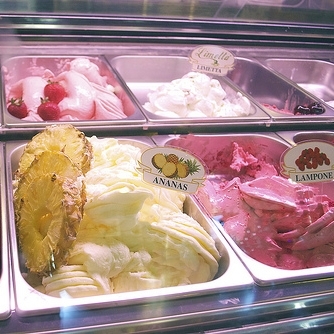 Medici's Gelateria & Coffee House in Oliver BC, the heart of the Okanagan valley where we make the absolute best premium Italian Gelato and Sorbetto. Medici's is a highly regarded tourist destination and receives the highest ratings on both Trip Advisor and The Urban Spoon We are an attractive and very comfortable setting in what was a former Catholic Church. Medici's offers intimacy, comfort, warmth and incredible food, drink and entertainment products in an environment steeped with European flair.